Mick, along with his friends Keith Elliott, Iris Moorshack, Brenda Chapman and Maggie Cox was there when it all started – all founder members of what was then ‘just’ an ‘After School Drama Group’. Doubtless none of these early participants had no idea whatsoever that what they help start, would go on for a further 20 plus years! It was this group that influenced the ethos of what the Drama Club was all about – not just about acting a part, but also about being creative, working as a team and gaining self-confidence – whilst building long lasting friendship and having a great deal of fun at the same time! Of course, Mick will be particularly remembered in this latter respect; also, along with Keith Elliott, for laying the tradition for ‘production’ meetings at the home of Mr ‘M’ – along with, of course, the complimentary post meeting ‘tea and cakes’ from Mrs ‘M’ – all of which said so much about the relationships that were developed between staff and pupils! 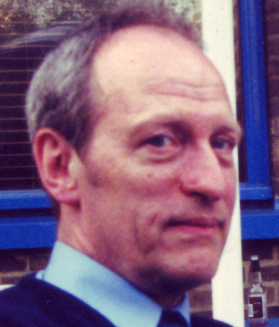 Mick clearly found his niche in the creative and performing arts and after leaving the Drama Club he went to The Central School of Art – duly encouraged and supported by both Cyril and John Jones., Margaret, his wife, tells of a letter that she recently found from John – describing Mick’s ‘single minded determination to follow his interests in theatrical art’. Mick stayed in touch with both of his former ‘mentors’ – with, in fact, Cyril and Hilda attending his marriage to Margaret in 1971 and also visiting them after they moved to Sheffield in 1976. 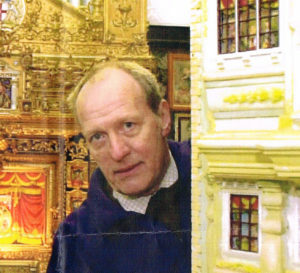 Similarly his relationship with John Jones continued over all these years – with John, then in his late nineties, making the trip to see Mick at the Covent Garden Punch & Judy Fayre in 2016. The ‘world of Punch & Judy’ clearly became of great interest to Mick and he produced a whole range of articles, books and memorabilia on the subject – along with a full length Pantomime version which would have been wholly appropriate to have produced at Markhouse. Its humour, wise cracking and traditionally ‘cheeky’ format was ‘very Mick’ and so clearly reflected his great sense of fun! Mick kept his design and layout work alive from his Studio in Sheffield and this included replicating and publishing Victorian ‘Toy Theatre’ Sets – and, as our photograph shows, also building quite large wooden versions that clearly showed their level of detail that he incorporated. These were from the very early days of the Drama Club and Margaret spoke of how pleased Mick had been to receive these reminders of these ‘successes’ in a number of Walthamstow ‘Youth Speaks’ Competitions. Conversely to these more ‘serious’ public speaking roles, those on the Mark House stage showed much of his other theatrical talents – and sense of fun. One specific memory of him, amongst many, is of his hilarious performance as a dodgy ‘Macbeth’ in ‘Spot the Lady’- both when sticking to the script and when (often) deviating from it. The Drama Club may well owe its subsequent Pantomime ‘ad libbing habits’ to Mick? As well as his great sense of humour, Mick was very artistic and creative. In addition to the existing website story of the model ‘Spider’ that Cyril kept and so obviously cherished, there is a further tale – also of an insect – from when he worked for the BBC special effects department on a Dr Who series! ‘he told us that he had spent weeks making a finely detailed replica of a `Bee` for an episode when The Doctor and his crew had shrunk to the size of insects. He had lovingly and painstakingly made this very accurate model and then presented it for the filming – but then described how devastated he was to see it hauled up in the studio and dropped, on purpose, to the ground – with dire consequences. All that time and effort into a one off shot’. He would probably never have thought that a simple tale like that, and one that he himself would have more than likely have forgotten many years ago, has caused him to live on in at least my memory! Given Margaret’s comments that he always looked on the ‘bright side of life’ and, that even whilst in pain in his last few weeks, he never lost his ‘wise cracking’ character, Mick probably, at some time after the loss of his beloved Bee, also saw its funny side!